The land of warriors, Rajasthan is a prominent travel destination in India. This desert land is a living testimony to a rich past with stunning landscape, grand palaces and forts, unique cities, vibrant culture, artistic wizardry and delectable food. Traditional cuisine is indeed a reflection of geography, local culture and historical influences. The gastronomic tales of this arid land are no different. From the meat loving Rajputs to traditionally vegetarian Marwaris, each group has left its indelible mark. Vegetarian and meat lovers will find unique dishes that lend a distinct texture and flavour to local foods. As water remains a precious resource in this Indian state, the recipes make minimal use of water. 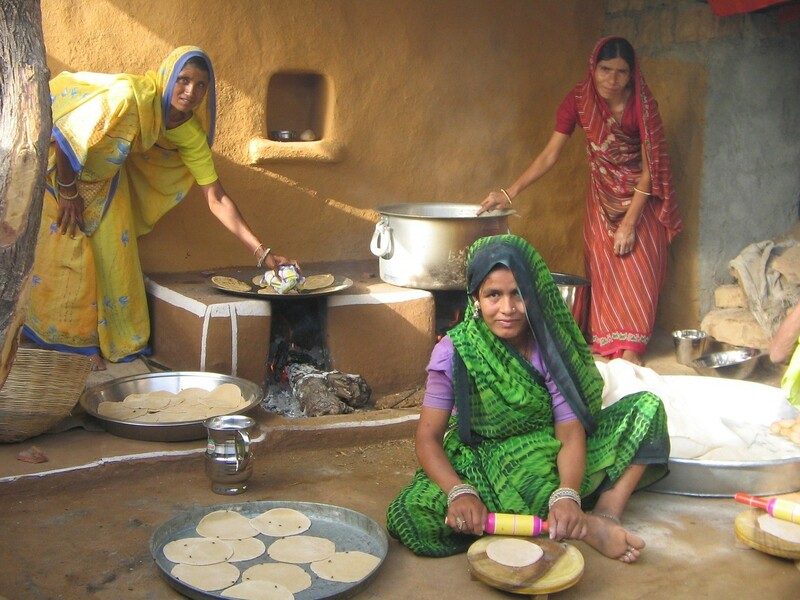 Over the centuries, womenfolk and family cooks (known as Maharaj) have developed recipes that substitute other liquids like milk, curd (Indian yogurt), cream or buttermilk (curdled milk without the fat) for water. Rajasthani cuisine is also famous for its use of ghee or clarified butter. The spice element aside, some of the meat dishes are fiery hot. If you have limited experience with hot foods, be careful when you order meat dishes. 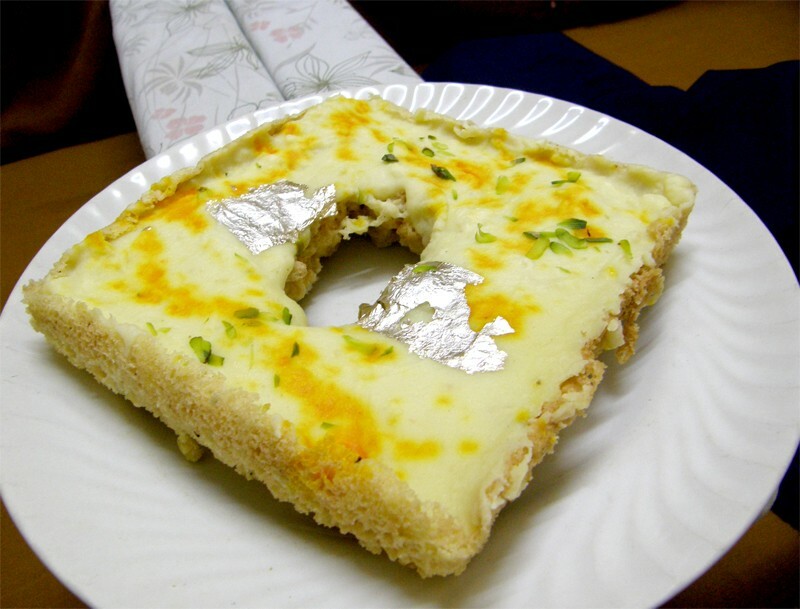 Tourists with a sweet tooth will feel right at home as Rajasthan boasts of succulent desserts. Is your mouth watering yet? 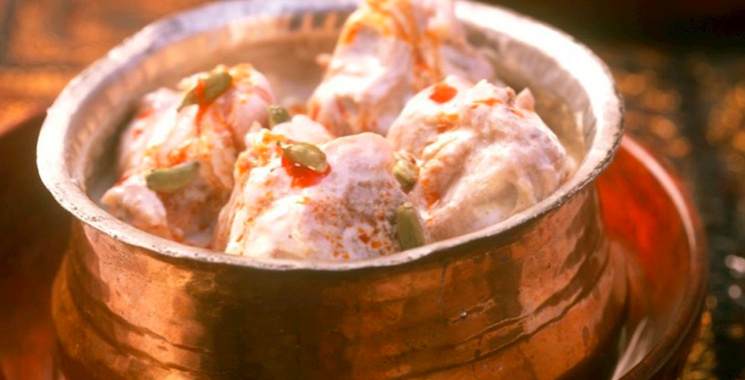 Hold on… as we bring you 10 must-try foods from Rajasthan. When you travel, you should eat like a local! This means a trip to the nearest eatery that serves you the traditional thali with an assortment of foods like roti/puri, rice, dal baati churma, aloo, gatte ki sabzi, aloo pyaaz, ker sangri, pakoda, salad and dessert. Most of the dishes listed below would be served as part of a thali, albeit in small quantities. Mostly thalis serve vegetarian dishes only, so if you are rather a meat-eater, it is worth checking other parts of the menu! This Rajput dish has round balls or gattas made with besan (gram flour) floating happily in creamy, spicy gravy containing spices and buttermilk. Savor it with flatbreads or rice. The spiced up balls finds their way into a variety of dishes including Gatta Pulav, Gatta Khichdi and Shahi Gatte. When you crumble roasted papads (thin lentil-based faltbreads) and add them to a yogurt-based gravy, you get this tasty curry dish. What goes into the curry? 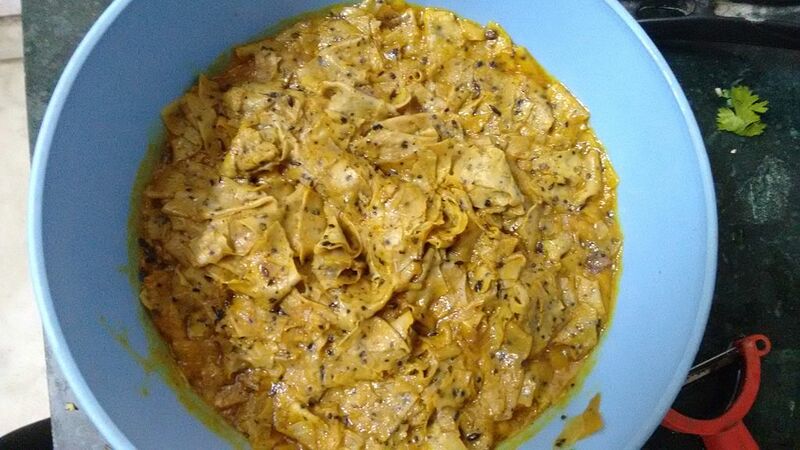 Besan or gram (lentil) flour, turmeric, red chilli powder and cilantro leaves. This curry served over steamed rice is a heavenly concoction. 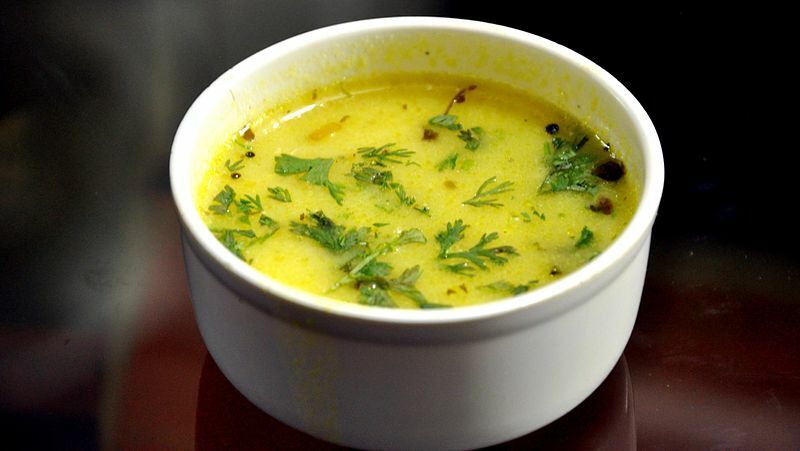 Every state in India has its own version of Kadi, a light soup, made with a yogurt and gram flour base. Beware – Rajasthani Kadi is as spicy as it gets! Adds a rich flavour to a cup of white rice. 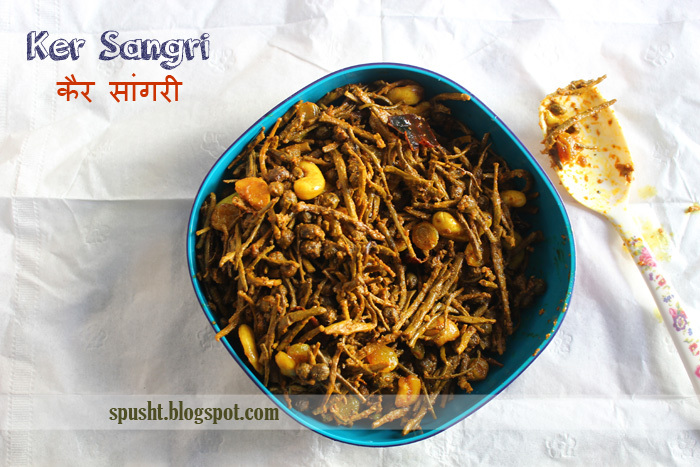 This unique dish combines Ker, a berry that grows in Rajasthani desert and sangria, a type of bean. This dish is truly unique because its key ingredients do not grow in any other parts of India. This simple yet delectable dish is cooked in vegetable oil. A dash of carom seeds, red chillies and other spices impart a pungent and tangy flavor to this side. This famous Rajasthani dish turns into a complete meal with the addition of rice and/or sides. The round Batis are stuffed and unleavened bread made with whole wheat flour. The standard filling contains onions, peas, and spices. 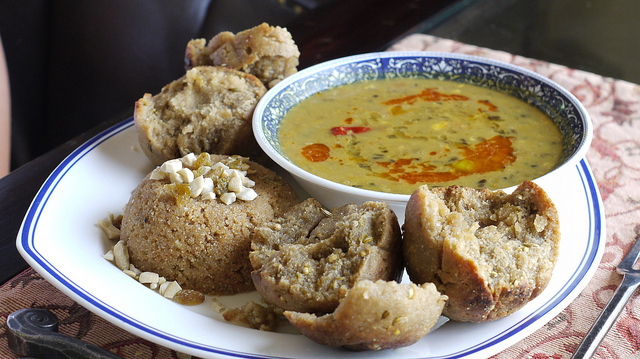 These are then dipped in ghee and served hot with Panchkuti dal and churma. Various lentils cooked with aromatic spices make the stew. Your sweetish churma is made by crumbling wheat batis and mixing them with jaggery (raw cane sugar) and ghee. 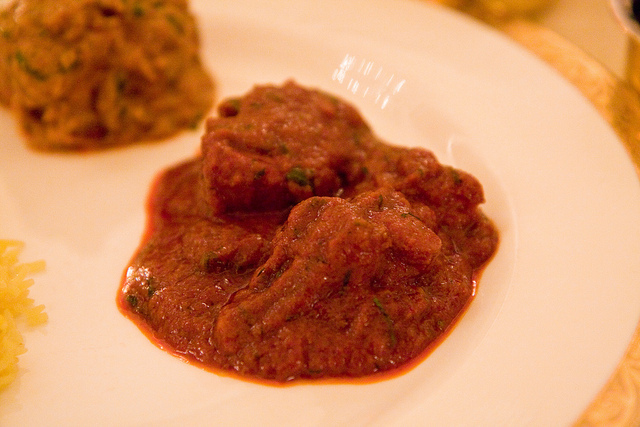 This red meat curry enjoys legendary status in Rajasthan. Not for the faint-hearted, as this dish serves you a fiery combo of mutton, red chillies and other hot spices. Goes well with rotis made from bajra (pearl millet). 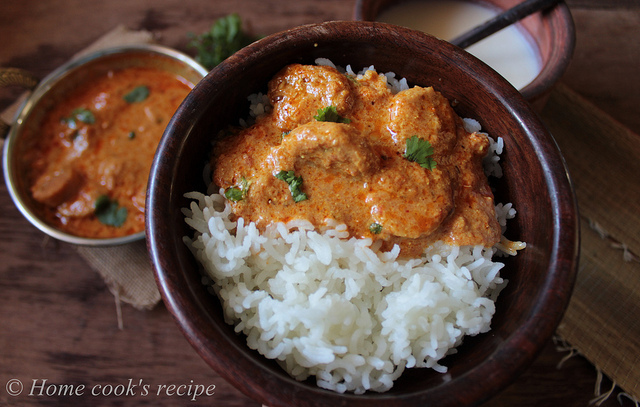 White rice looks scorching hot when doused in this red coloured curry. A traditional dish made with tender chicken pieces. This stew is made with chicken perfectly cooked in creamy white gravy. The gravy is made with local spices, cream, milk and curds. A generous measure of cashew nuts gives a creamy and nutty flavor to this meat dish. It is usually served with long grain basmati rice or whole wheat rotis (Indian flatbread). 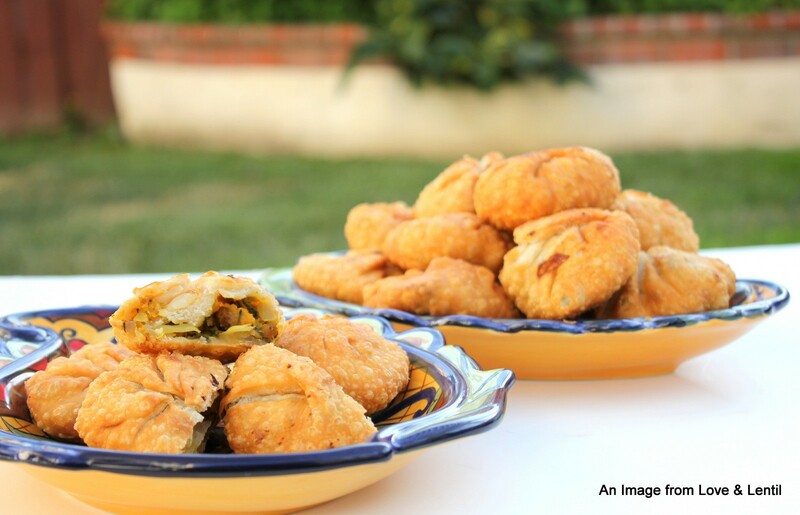 A staple breakfast or evening snack, pyaaz kachori is flaky, deep fried dish filled with spiced potatoes and onions. Enjoy it with tamarind-dates chutney and /or mint chutney. Spices include red chili, fennel seeds, cumin seeds, and turmeric. A street snack contains spiced potatoes stuffed into green peppers. 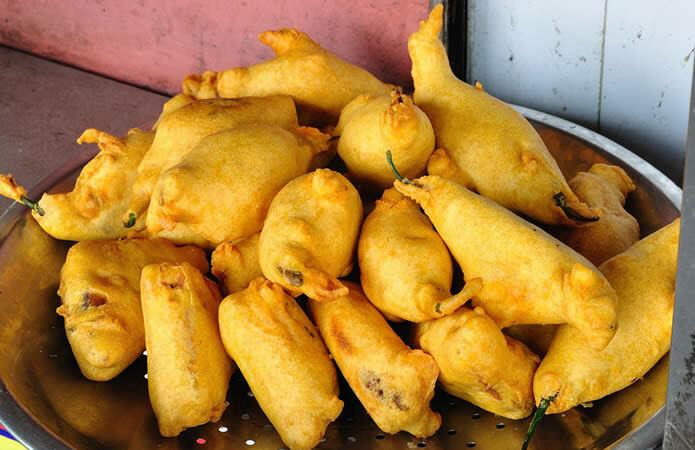 The stuffed peppers are dipped in a thick batter made with besan (chickpea flour), and deep fried until they turn a rich golden brown in colour. This dish is accompanied by tangy tomato chutney. 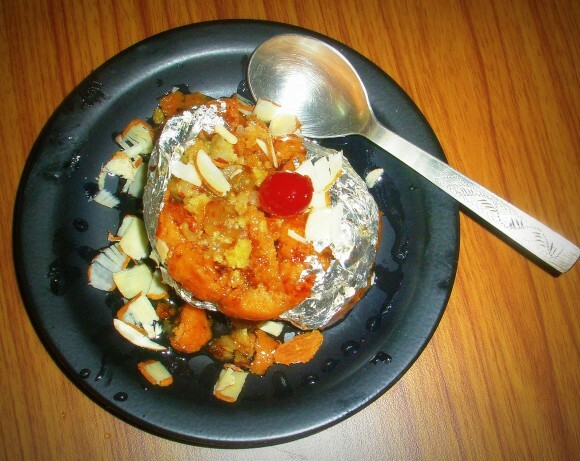 This sweeter version of the savory kachori is filled with khoya (milk cream solids) and dry fruits. Watch out for the calories, as this is another deep fried dessert that gets drenched in flavoured sugar syrup. If you happen to be in Rajasthan, don’t forget to sample this unique dessert made with maida (refined flour), paneer (Indian cottage cheese) and ghee. After a good soaking in saffron and cardamom-flavoured sugar syrup, this sweet dish becomes hard to resist. 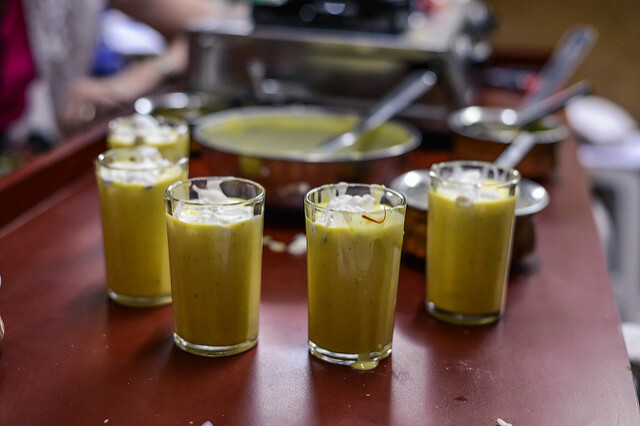 A coolant, this buttermilk drink comes in varied flavours. Served with a dollop of cream, this summer drink is truly delectable when you add spices, almonds, saffron, mint or even mango. 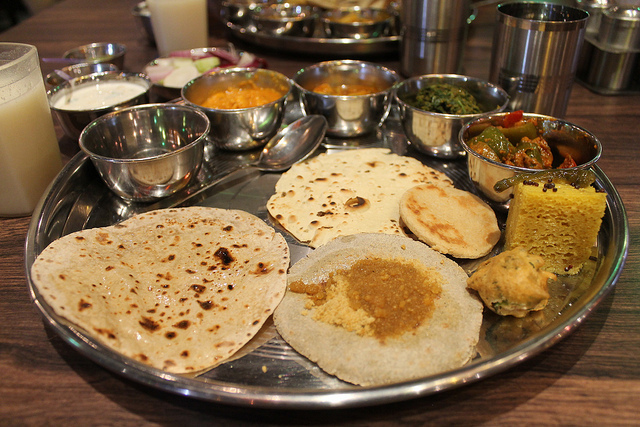 Do you have favourite Rajasthani foods to add to this list? Leave a comment and let us know. We will gladly add them!